It seems people are always searching for a better way to store their Christmas ornaments each year. My family loves to get out the ornaments and decorate the tree each year, but taking each ornament out of its individual box can be quite a pain, and it is even worse after the holiday season is over when you have to put everything away. By then the excitement is gone, and repacking the ornaments individually just seems rather tedious. In addition, what about the ornaments that are fragile, but somehow no longer have their original packaging? Does it take you hours to wrap all these up in tissue paper to keep them all cushioned? 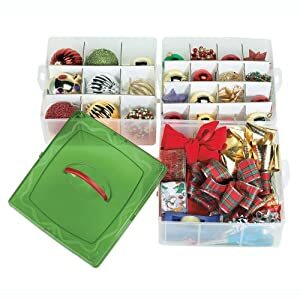 If you are searching for a better solution, you may want to try a Christmas ornament organizer and storage solution, like this product. There are many ways to store your ornaments. This product provides three trays to individually hold ornaments within divided sections, so they don't clink and clang together. Then, when you have filled all the dividers up you just snap and stack the three tiers and pop on the top for easy storage until the next year. I have used these for the last several years and I LOVE them!!! You can trim the dividers to make room for larger ornaments and the other ornaments don't bump or bang into each other. Couple of tips though....I put a thin piece of foam on the bottom for extra protection... and also double check to make sure the sides are latched, I have had the kiddos help and almost had a major accident :) when they weren't completely closed. Definitely a good buy! !